Most mats begin safe. But many will bend, tear and crack within months. Barefoot will not bend, tear and crack like other mats. Watch videos to see Barefoot’s strength against others. 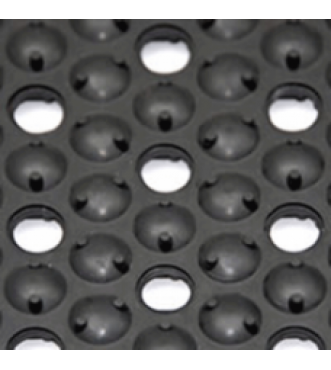 Barefoot Anti-fatigue Matting is not just an ergonomic anti-fatigue mat, but a highly effective safety mat that provides exceptional comfort for people who stand. Barefoot Ergonomic Floor Matting’s performance is attributed to its unique matrix of tri-radial supports. This unseen engineering behind every Barefoot module is the technical reason why it’s rated the best overall and first in all major ergonomic categories. Barefoot ergonomic floor mats uses quality rubber found in athletic shoes. Our material is un-compromised, without cheap fillers that are found in almost every import. And Barefoot mats are made only in the USA! Standard High grade EPDM rubber. Excellent for most all applications that do not come in contact with petroleum derivatives and harsh chemicals. UV and ozone resistant. Available in solid surface or drain through styles. Also available by request in Nitrile - Oil Resistant Quality blended Nitrile rubber with a high degree of oil resistance. 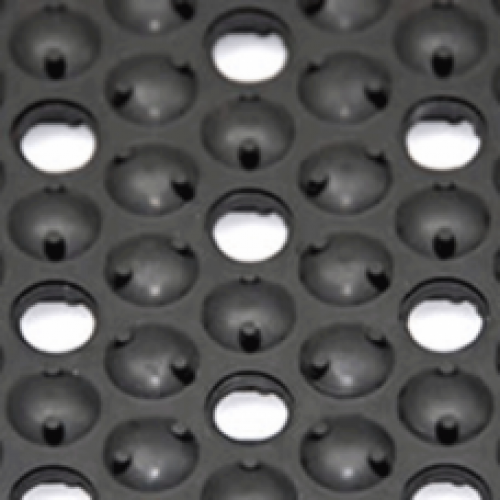 Excellent for manufacturing plants and machine shops where exposure to shop oils can degrade standard rubber. Details In areas that are exposed to grease and oil, use Nitrile rubber. Oil and Chemical Resistance / Nitrile compound: Nitrile rubber (acrylonitrile butadiene rubber) has resistance to aliphatic and aromatic hydrocarbons, acid and alkali. Examples include motor oil, hydraulic oil and petroleum greases and paint thinner. Nitrile rubber performs poorly when exposed to oxygenated solvents and chlorinated hydrocarbons. Mats in oily areas must be properly maintained. Examples include MEK (methyl ethyl ketone) methylene chloride, xylene and bleach. Also available by request in Conductive / ESD Specially compounded EPDM rubber for the electronics industry. Each module is certified to be 1 x 10 to the 4th to 1 x 10 6th ohms, surface to ground resistance. Details The ESD version of Barefoot® has the same ergonomic qualities as the Standard Barefoot®. It also has certain specified electrical properties required by the electronics industry. Each Barefoot® module is tested six times before it is certified, packaged and sealed.